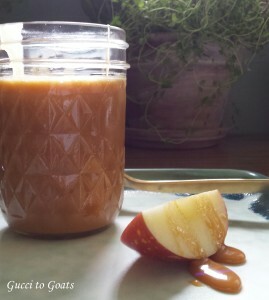 Whenever I have a couple extra quarts of goat milk I love to make caramel sauce (Cajeta). It can be made with fresh cows milk too, but then it’s called dulce de leche. 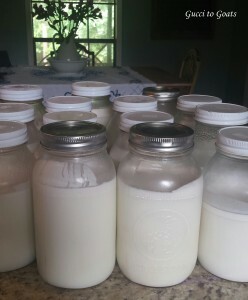 This is only half the milk I need to use! It’s simply decadent! Kids love it, adults love it. I always give extra jars to family and friends, otherwise I can’t stop eating it. Drizzle it over ice cream, use as a fruit dip, mix it with popcorn and bake, add it to sugar cookies, however you wish you use it you’ll love this creamy treat. add the milk and sugar in a large (preferably tall) pot and bring to slow, rolling boil. Once it’s simmering well, remove from heat and SLOWLY add the baking soda mix. Usually it will bubble up and can often double in size – which is why you want a large pot. Once the mixture has settled put it back on the heat and stir often while you cook down the mixture. You’ll start to see it thicken and turn caramel color. I usually use medium to medium high heat but I prefer a slower process and tend to keep it a more to medium. This process can easily take an hour or longer. 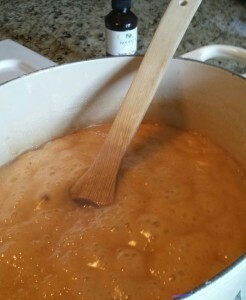 When the caramel is the consistency of syrup you can add the vanilla (and salt), remove from the heat. It will thicken a bit as it cools. I add it to jars before it cools for ease of pouring. Depending upon how much you reduce the sauce it usually makes 3 small jars of sauce. Sometimes I have an extra quarter jar. 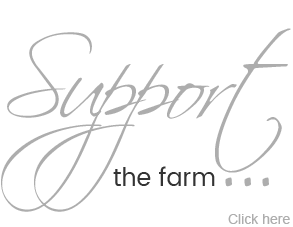 I’m Jake Keiser, a former city girl seeking self-reliance and a fabulous farm life in Oxford, Mississippi.